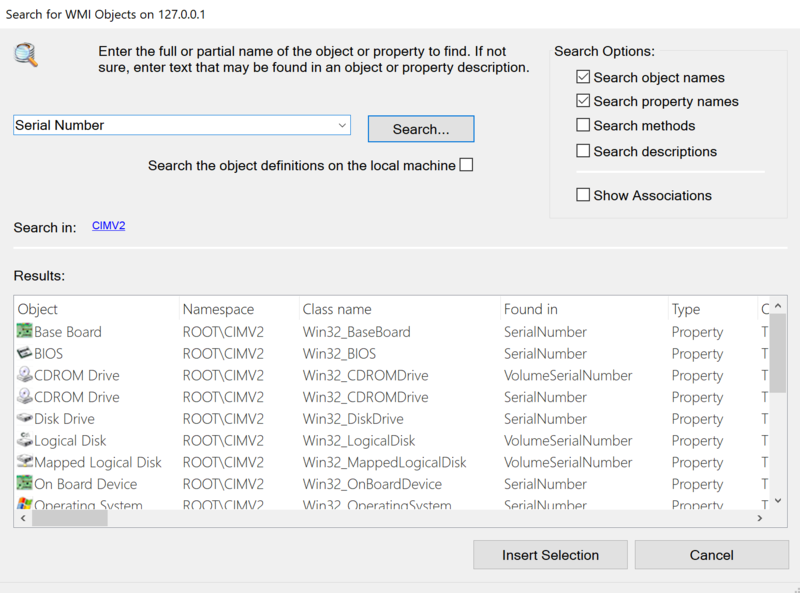 Goverlan’s WMI Explorer has a powerful search feature which allows you to search for objects in any of the available namespaces. The search feature can be used at any time in any of the available views. It allows you to search for WMI objects which include a specified string in its name, or objects which contain a property, or tasks which include the specified string in their names. To search for an object, enter a string which identifies the object and click on the Search button. The string entered can be the class, property or method name, friendly name, or any string which can be found in the object’s description. Once a search is started, it can be stopped at any time by clicking on the Abort Search button. The Search window includes a set of options which will define the scope of the query. Selecting the appropriate options will provide you with a more accurate result set. Search object names Enable to include the object names in the search. Any object which has a name or friendly name which contains the search string is returned. Search property names Enable to include the object properties in the search. Any object which owns a property with a name or friendly name which contains the search string is returned. Search methods Enable to include the object tasks in the search. Any object which owns a task (method) with a name or friendly name which contains the search string is returned. Search descriptions Enable to include the object, property and method’s descriptions in the search. Any object which has a description or has a property or method description which contains the search string is returned. Show Associations Allow the search results to include Association classes in addition to regular classes. Note: The search window only returns objects which can be accepted by the view that initiated the search. You will not be allowed to modify this property if you started the search from the View by Namespace & Class view. The view itself has a Show Associations option which dictates the value in the Search window. Likewise, the search results will not include any system classes or pure abstract classes if the namespace view has the Simplify View option enabled (See Namespace and Class view). Search the object definitions on the local machine Searching for WMI objects requires one or more WMI namespace repositories to be opened first. This may take some time if the namespaces to be searched are large and if the target machine is a remote machine (see Remark below). If you are confident that your local machine includes the object you are looking for in its repository, you can enable this option. If this option is enabled, the WMI repository of the local machine is searched instead of the WMI repository of the target machine. If disabled, the WMI repository of the target machine is searched. Note: If you are in the Namespace & Classes view, selecting to set the focus on a resulting object will still require the WMI namespace of the selected object to be opened on the remote machine. Remark: The most time-consuming part of a search action is the initial querying of the selected namespace’s class hierarchy. However, once a namespace hierarchy has been queried, it is cached for future use and subsequent queries will be very fast as long as you do not switch the focus to another target machine. The search string can be the full name of the object or its friendly name or part of its name. The namespaces which are queried when you activate the search are displayed to the right of the Search in link. 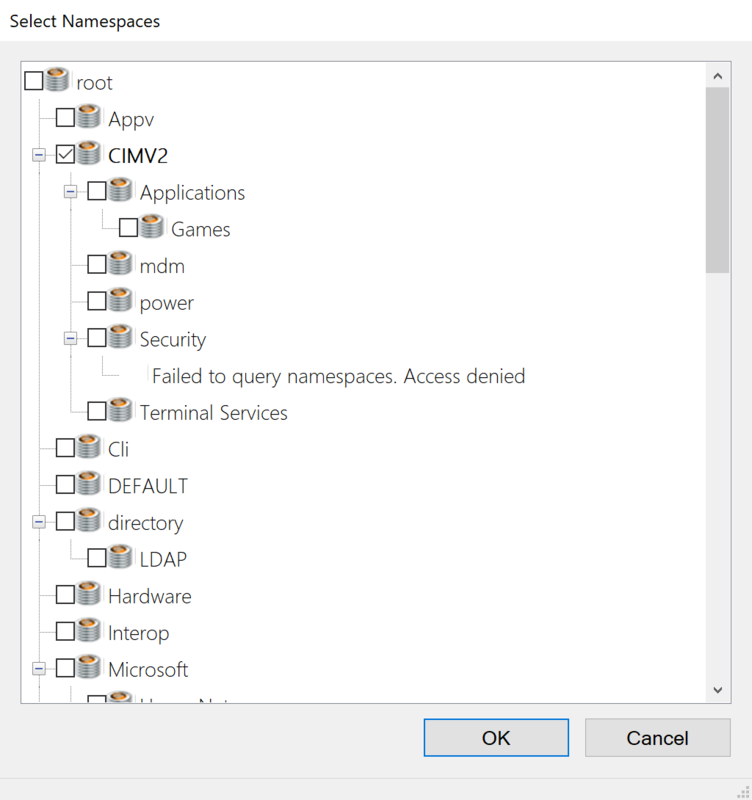 To modify the list of namespaces to search, click on the Search in link, select every namespace you want to search and un-select every namespace you want to exclude from the search. Once you have configured the search string, options and namespaces, click on the Search button. At this stage, every namespace selected is opened and searched for the specified string within the configured scope. As objects are found, they are inserted in the Results window. Object The display name of the object. Class name The WMI name of the object. Found in The name of the object, property or method in which the search string was found. If the search string was found in the description of the object, property or method, it is indicated in this column. Type Type of member in which the search string was found. This can either be: Object, Property or Method. Object Description Description of the object found. Tip: You can sort the result set by clicking on any of its column headers. You can also prevent the columns from auto-resizing by right-clicking on the column headers and disabling the Auto Column Width option. Note: Since a search string may be found in a single object’s name, property, method or description, the result list may include the same object multiple times. Once the search is over, you can either enter a new search string or scope and start a new search. To return to the previous view with a selection, double-click on an object in the result set. To select multiple objects from within the result set (if allowed), press and keep pressed the CTRL key and click on the desired entries. While keeping the CTRL key pressed, you can also use the SPACE key to select/un-select entries. Depending on the view you started the search from, different actions are taken with the selected search result(s). The Browser view/ WMI GUI Tool adds every selected result object to the list of root objects. The Namespace & Class view sets the focus on the selected result object. The WMI Query Tool initializes the default query string using the name of the selected result object. The Report Manager Tool adds the selected result objects into the list of objects to be reported in the report template.